Ray-Ban RB3386 Sunglasses are an active lifestyle frame that features oversized lenses and a comfortable fit. Ray-Ban is an internationally renowned brand that encourages its wearers to be original, be independent, and to NEVER HIDE. Patented Ray-Ban signature on both temples. 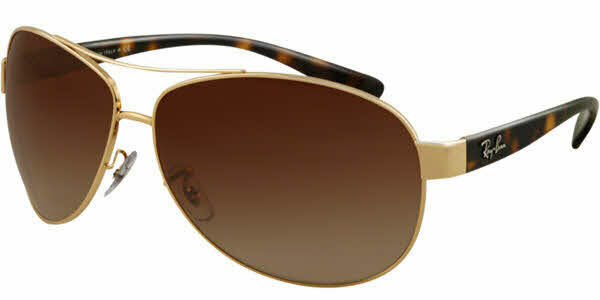 Aviator style flatters a variety of face shapes. Comes with a Ray-Ban carrying case & cleaning cloth. These are perfect! I had a pair of the same ones for 9 years, until a friend's kid accidentally stomped on them and snapped off one of the arms. I looked everywhere for the 63mm Arista and finally found them here. Thank you very much!! The lens size on these Ray-Bans is excellent for my Harley rides to avoid wind and stray light. I always go polarized since I wear sunglasses during bright light conditions. (Overcast days don't necessitate them for me.) And this model in the larger of two sizes make my rather big face look well-proportioned. By the way: You will NOT beat FramesDirect.com price! And if you become a frequent buyer you will get "credits" that knock the prices down to near or at wholesale. Equally important is that you NEVER have to worry about getting "knock-offs" or fakes from FramesDirect.com. I know what to look for and EVERYTHING is always where it should be in terms of markings on the frames and lenses, packaging, insert materials, quality, etc. Buying from FramesDirect.com is always a safe buy in terms of legitimate products and best pricing. I NEVER buy Ray-Ban, Persol or any other quality sunglass anywhere else. These shades was everything that I wanted and more. It has a classy look albeit on the the big side (should've gone with the smaller size). Everybody seems to love these shades and often ask where I bought them at. I would definitely buy the same model of shades in a different color for my collection.